Calling all mathematicians and math professionals: thanks to the generosity of Winton Capital Management, MoMath has a lecture series with you in mind. The MoMath Winton Power Series is targeted at a mathematically sophisticated audience, and provides a forum for top mathematicians to share a significant topic or discovery they are excited about. Each presentation will be followed by a question and answer session and an informal reception. 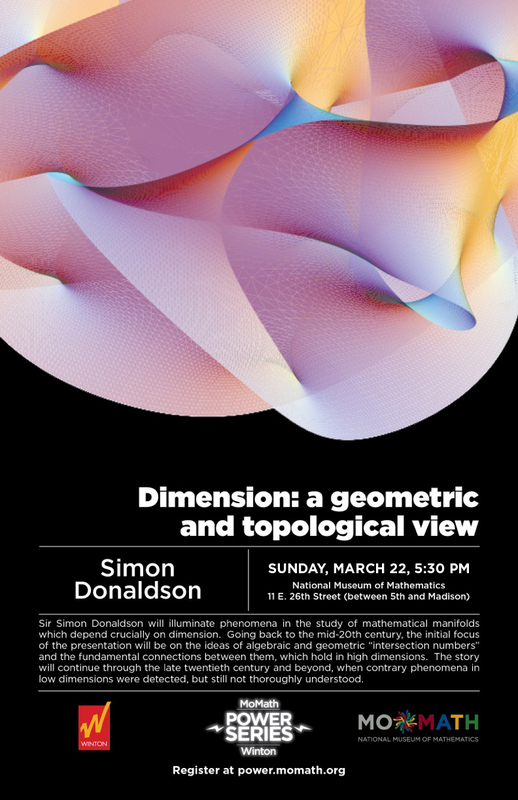 Simon Donaldson will illuminate phenomena in the study of mathematical manifolds which depend crucially on dimension. Going back to the mid-20th century, the initial focus of the presentation will be on the ideas of algebraic and geometric “intersection numbers” and the fundamental connections between them which hold in high dimensions. The story will continue through the late 20th century and beyond, when contrary phenomena in low dimensions were detected, but still not thoroughly understood. The National Museum of Mathematics gratefully acknowledges the support of Winton Capital Management, which makes this public presentation series possible. The MoMath Winton Power Series is delighted to announce that two of the recipients of the first Breakthrough Prize in Mathematics, Richard Taylor and Simon Donaldson, are Power Series presenters. Richard spoke on October 5, and Simon will be speaking on March 22. By registering for a MoMath Winton Power Series presentation, you agree that you may be photographed or videotaped by Museum staff and associates. • 2013 Sep 29 – Sir Timothy Gowers – Can Computers Replace Mathematicians?